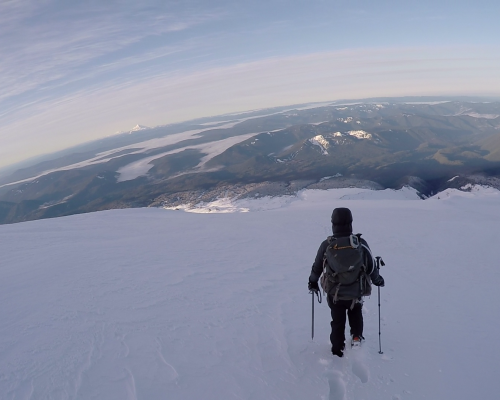 As a child, I often wondered what it would be like to climb to the top of the various peaks that were littered throughout the Pacific Northwest. However, there is a difference between the idea of climbing and the reality of what that experience entails. The moments leading up to those first steps on the summit blur the line between a surreal exhaustion and the traditional world that you’re used to living in. So who was the first to summit Mt. Hood? According to historians, the first documented climb was completed by Mr. Henry Pittock in 1847. Yes, the same Pittock of the famed Pittock family that built Pittock Mansion in the hills above Portland, Oregon. He also went on to own the Oregonian newspaper. Pittock, Pittock, Pittock for days. However, the more likely first climbers were probably native to the region. The now extinct Multnomah tribe referred to the mountain as Wy’East and believed it was inhabited by the gods. If that’s the case, then the estimated 10,000 people who summit Mt. Hood each year have been venturing in to a land once reserved only for the fantastical and other worldly. Indeed, it does feel like a different planet. There are a few things you should know about this mountain in the context of a summit attempt. Civilization was always within view. 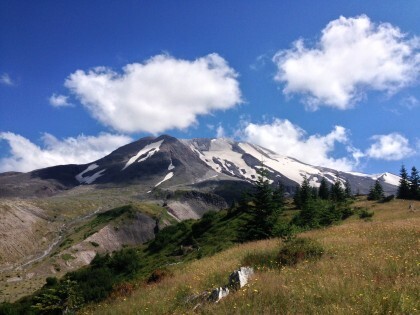 We never lost sight of Timberline or the summit. The weather was clear, albeit dangerously cold, which resulted in exceptional visibility. I am not aware of any other mountain in the region that gives you a view of both the start and the finish throughout the majority of climb. At opposing ends of the spectrum we had the comforting, orange warmth of the lodge behind us and the frigid, white peak of Mt Hood before us. A constant reminder of where we had come from and where we wanted to go. We had nearly every modern advantage afforded to us. 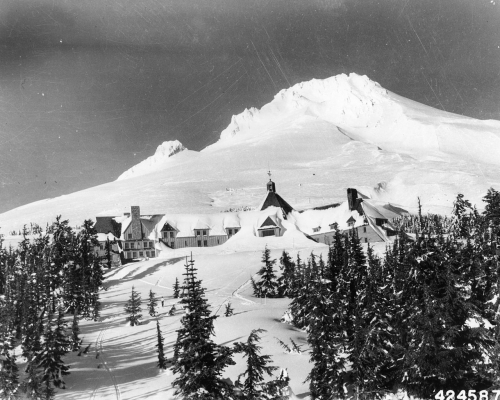 From a historical perspective, early attempts to summit the mountain meant spending days traveling from Portland to Government Camp. 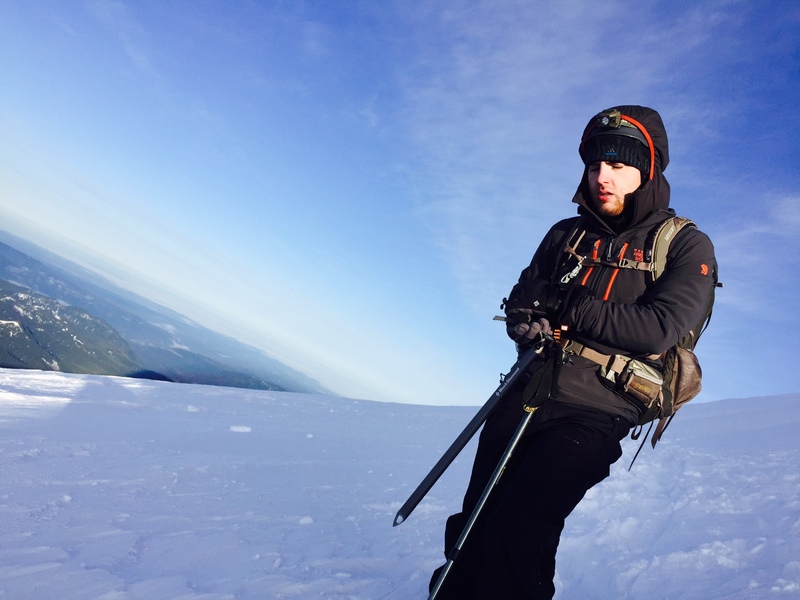 Another day was required to travel to Timberline and another day to make a summit attempt. 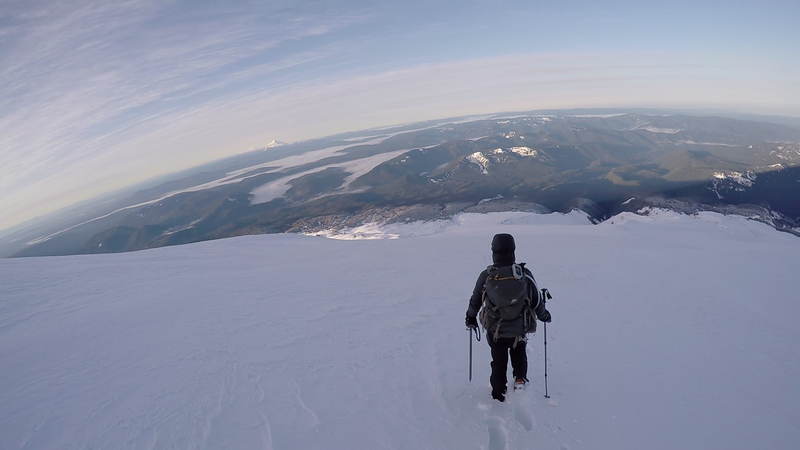 Climbing down the south slope of Mt Hood. Over the past 150 years attempting to summit Mt. Hood has become easier but no less dangerous. We have domesticated a glaciated monolith and allowed for climbers to drive to a point nearly 3 miles from the summit. Timberline Lodge is the check-in station. It radiates heat on you while you’re filling out a climber registration slip and the walls are plastered with posters warning of dangers on the mountain. 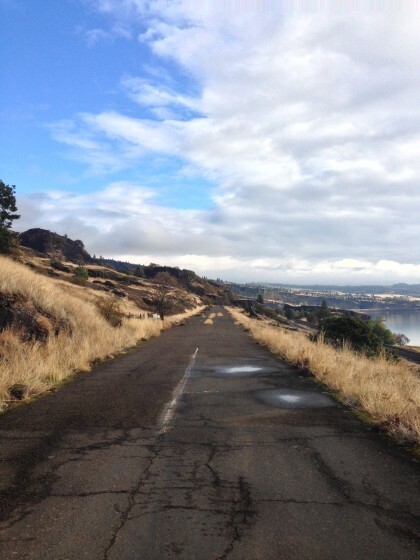 Indeed, a lot can happen in 3 miles with nearly 6,000 feet of elevation gain. Preparation is vital, as weather conditions can change rapidly. I brought my trusty hiking partner along on this first attempt. We’ll call him Cheval. When I showed up at Cheval’s place at 10:30pm, we both acknowledged that we were both battling illness. Despite sickness coursing through our bodies, Cheval insisted that we continue with our plans regardless of his contraction of the common cold. Although my system was loaded with antibiotics and my tonsillitis was clearing up, the swelling in my throat persisted. This made ingesting any liquids or food painful. Immune systems be damned, we said. Any mountain that was climbable and had an opening of decent weather on that early Thursday morning, was suitable for us. As 12:00am rolled around, we completed our climber registration check-in and made final adjustments to our crampons. The air was insidiously cold that morning and the skies were clear. The moon shown above our heads and provided so much light that we simply switched our headlamps to night-mode. The face of sickness, cold, and fatigue. We followed a path alongside the ski lifts. The personnel at Timberline were out scraping and plowing the ice and snow in preparation for the skiers and snowboarders that would inevitably show up later that day. The hike up to the end of the ski lifts was unnecessarily brutal on our bodies and took a mind-numbing 6 hours to complete. There was the slightest breeze which whipped the sub-freezing air in our faces and nibbled at our fingers and toes. It became immediately apparent that the effects of tonsillitis had weakened my body significantly. A sub-1000 calorie daily intake equated to a loss of 5 pounds over the course of a week. 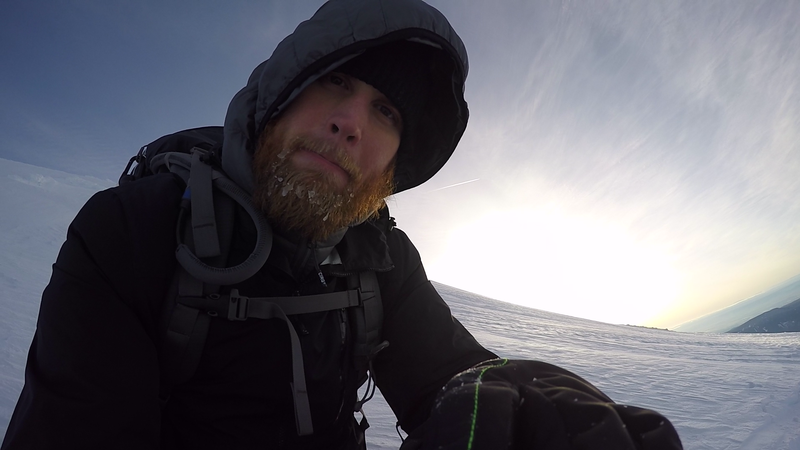 Little to no exercise resulted in weakened muscles and lungs that were shocked that they had suddenly been demanded to climb a mountain on this incredibly cold and early time of day. Cheval’s face showed signs of fatigue that mirrored my own feelings on this venture. It seemed that we had taken on too much. Pausing to catch our breath, eat a snack, or take a sip of water for longer than a few minutes meant that our bodies would slowly begin to freeze. It always starts in the smallest extremities, like the fingers and toes. The numbness that the body feels is the first warning sign. At several points I had to vigorously shake my hands and legs to stimulate blood flow to the outer regions of my limbs. Simply ignoring this part of the process is not an option if you value your digits. As we stood at the end of the ski lifts under the overhang of a large garage door used to store snow maintenance equipment we looked back down the side of the mountain. 6 hours and it looked like we had only hiked a mile. The lodge remained distinctly visible at the base of the mountain. It looked warm and cozy in the midst of the frozen night. 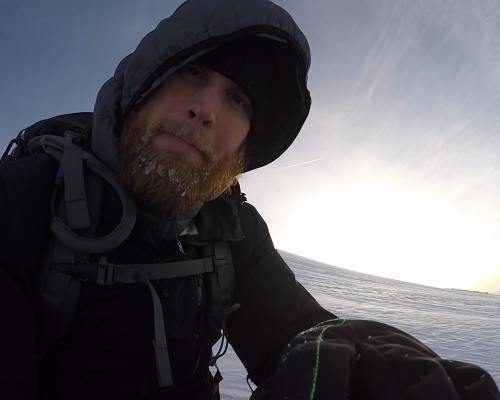 Condensation had started collecting and freezing on my beard since we had started climbing but it made little difference as I was more focused on keeping my arms and legs moving. The next leg of our journey involved actually climbing the mountain. We had no idea if the snow would be compact enough for a steady ascent or if post-holing would be required up to the peak. As it turned out, post-holing was our fate. Slow, arduous, time-consuming, cold – these are a few of the terms I would use to describe the process of post-holing in powdery snow. Somehow, despite all of this, my spirits began to lift right about the same time that the sun began to rise in the east. When the temperature is exceptionally cold the sky has a very distinct blue tint to it, almost as if the air itself is frozen in place and the only way to breathe it in is to eat through it like pac-man. The summit seemed so close; it felt attainable. Crater rock was on our front door step and the pearly gates sat comfortably behind it. 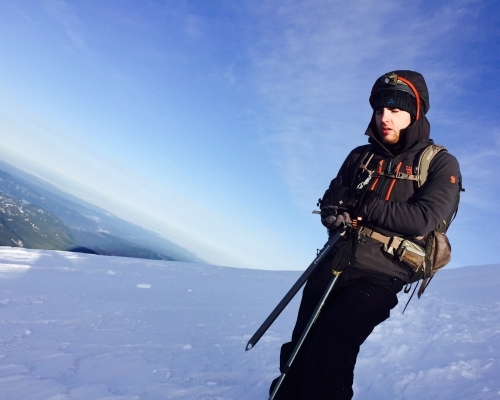 My limbs were finally feeling warm and my body recalled the training that it had received on Mt. St. Helens. In the back of my mind though there was the constant warning that came with pushing yourself past your limits, only to be stuck at the destination with no energy left to make it back to base camp. There was also the fact that we were a team, and that we either reached the top together or not at all. When Cheval stated that his toes were turning blue we had no choice but to call it off. Toes were not a price either of us wanted to pay as part of the cost of this trip. We knew that that mountain would remain and that next time we would be better prepared. Maybe we would even bring a drone to the summit with us.